You are here: Home / Great Deals / More Facebook Changes! I posted a small blurb on the Facebook Wall about this, but, I thought I would write about it for those not seeing what gets posted on the Facebook Wall. 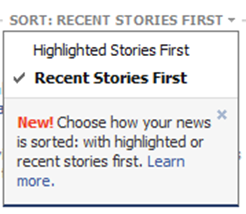 Facebook is making changes AGAIN! But, at least this one is a good one, I hope for us all! 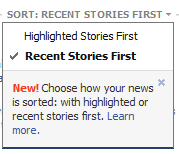 We now can choose to sort by recent posts first instead of that completely screwed up way it has been posting – yeah, I have hated it! Then it will be the way it was before, where you will see all of the posts as they happen! Hopefully it will make it where everyone can see the posts that have been hidden! They did say it will take a few days for everyone to see that option – so, if you don’t see it now – keep checking! Thanks Renae at How To Have It All! Just did it. So happy. Natacha Ruth Musser via Facebook » Me too! I hated all those crazy changes! I don’t have that option??? The only new thing I see is the chat bar and the ticker are not the way they were!! Any thoughts? Gabby » They are changing over a few days – if you don’t see that option right now just keep an eye out for it, it will show up!